Have you noticed all the people wearing rubber boots lately? I first started to notice this a couple months a go and didn't think much of it. 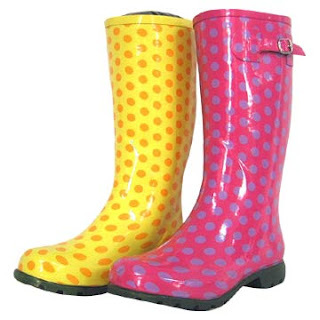 Now with all the melting snow and rain, it really has become a trend, funky rubber boots! And there not just for backyard gardeners. When I was a little kid, I know I had a pair of plain black rubber boots that I use to wear in the yard to play when it was wet out or when my Father took me clam digging. Rubber boots have come a long, long way since then. There is a senior lady who I see daily at my bus stop, and everyday she has on a pair of leopard print rubber boots. Yesterday I noticed a couple teenage girls wearing a pair of pink ones with little shoes on them. Today I noticed a girl in her 20's wearing a pair of polka dot ones, and my neighbor, who is in her 50's had on a pair of red and black plaid ones. Rubber boots are everywhere and are for all ages! I have been a part of a fashion trend and didn't even know it. I bought myself a pair of these funky boots a few months back. Mine are green plaid and fleece lined. I thought they'd be perfect for slipping on to go out in the backyard during the winter. They are easy to put on, comfortable, and they keep my feet warm and dry. I don't think I'm up to wearing them out though, I'm saving my funky fashion boots for the place I love most, the backyard. I have a fascination with rubber boots! I've always dreamed of having a little girl with rubber boots, playing in the mud puddles. Just like when I was small. I have a pair of ankle rubber boots. They are blue with green trim. I absolutely love them! When I see other people wearing rubber boots, I think those are cool. I'm waiting for the right pair to jump out at me, and scream, "BUY ME!" They are hard to drive in, which is why I'm delaying. I think my teenaged daughter might like them, but I only wear rubber boots in the yard also. I love the funky rubber boots these days! I never had a pair of rubber boots when I was a kid.